but what are quality tires that fit? As @Wooders28 said, the surface really matters. Yes, the surface matters, (yes, I'm a parrot today). I run bashers. I have several sets of these all-terrain type tires. 4 wheels + 4 tires for about $15. 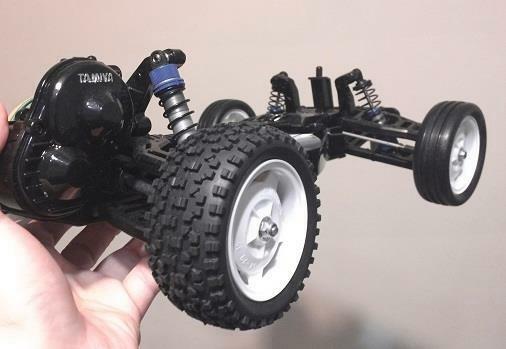 If you try to transplant the tires onto Tamiya wheels, these tires are a bit larger (even though it looks fine on the photo). You might want to use caulk or double-sided tape on the wheels. Here is another set with pin type tires, if you prefer something similar to Tamiya's original pin tires. I would imagine these would also be slightly larger. I don't know why they say Chrome. Maybe they think "chrome" means something like "cool?" If running 2" wheels on astro or grass, these work quite well and are quite a long lasting tyre, (fronts are T693), I've run a load of 3s packs through my Mid which is running them. I run Schumacher cactus, yellow compound on the rear of my kf2se on carpet ,it's running a 6.5t reedy motor, and that'll maybe get 6 runs off them. It's always a compromise between grip and longevity, those blocks in the link are blue compound, so longer lasting, but less grip than the yellows.